Nice to hear the truth for a change. The paper drew on the work of James Shapiro (who by the way had co-authored a paper with Discovery Institute Fellow, Richard Sternberg here). I hate to give attention to my Chicago colleague James Shapiro’s bizarre ideas about evolution, which he publishes weekly on HuffPo rather than in peer-reviewed journals. His Big Idea is that natural selection has not only been overemphasized in evolution, but appears to play very little role at all. Even though he’s spreading nonsense in a widely-read place, I don’t go after him very often, for he just uses my criticisms as the basis of yet another abstruse and incoherent post. Like the creationists whose ideas he appropriates, he resembles those toy rubber clowns that are impossible to knock down…..
His never-ending attacks on natural selection and neo-Darwinian evolution should be an embarrassment to HuffPo, which will apparently publish anything since they don’t have to pay for it; but they’re also an embarrassment to me, for Shapiro works at my university and, in my view, his writings impugn our reputation for excellence in evolutionary biology. So again, I tender my challenge: tell us, Dr. Shapiro: you’re always banging on about new sources of genetic variation, but you never seem quite able to tell us how that variation is translated into adaptive evolution. If it’s not natural selection, what is it? Coyne thinks Shapiro has appropriated creationist ideas. Shapiro’s ideas are referenced in the above peer-reviewed article. I’d say that’s progress. Virtually all of the non-creationist opposition to the modern theory of evolution, and all of the minimal approbation of Shapiro’s views, come from molecular biologists. I’m not sure whether there’s something about that discipline (the complexity of molecular mechanisms?) that makes people doubt the efficacy of natural selection, or whether it’s simply that many molecular biologists don’t get a good grounding in evolutionary biology. molecular biology graduate students (for instance) don’t know much, or any, evolutionary theory… Students don’t see the point of storytelling. They could take a Fiction Writing course for that. It was nice to see Coyne’s name not mentioned in this article, and the only mention of Richard Dawkins was in reference to Dawkins mistakes. Professor Denis Noble is President of the International Union of Physiological Sciences. Physiology (physis), meaning “nature, origin”, and (–logia), meaning “study of”) is the scientific study of function in living systems. This includes how organisms, organ systems, organs, cells, and bio-molecules carry out the chemical or physical functions that exist in a living system. 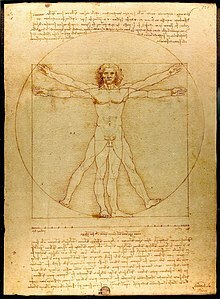 Speaking as one who has examined the original Vitruvian Man drawing, I can say that Leonardo was looking for a numerical design scheme that informs the proportions of the human body. The drawing began as an illustration from Vitruvius’ book, De Architectura where Vitruvius justifies the use of the square and circle as design elements because those shapes are integral to the human body: a man’s height is equal to his width (with arms outstretched) as a square, and a circle drawn with the navel as center and feet as radius is coincident with the hands’ reach. Leonardo also notes the other proportional relationships from Vitruvius such as the head height measures to the whole as well as the arms and hand sections. Leonardo then continued measuring (from the evidence of pin point indentations made by walking dividers, especially along the left vertical edge) to find more proportional relationships. He would take a measure of a part of the figure with the dividers and walk that measure along the height to see if the measure would fit an even number of times. From this drawing and others where Leonardo was working on the same type of problem it is evident that Leonardo believed there was a something like a unified field theory of design where everything in nature was related by numerical and geometrical design systems. He was one of the original ID thinkers. Thanks ba77. That is a good reproduction where you can see a lot of the details. Unfortunately, some details are only visible when viewed under raking light. There you can see the marks from drafting tools. For example, there are incised lines corresponding to most of the inked lines of the figure. These indicate that Leonardo used a transfer method to copy this image from an earlier, lost original. With that original placed on top of the extant sheet he incised with a stylus the outlines and internal details of the figure leaving the impressions on the sheet below. The corners of the square were also pierced through from the upper sheet. All this shows that Leonardo must have gone to great pains to create a figure with proportions that corresponded exactly to those of Vitruvius. The video lecture by Noble was originally posted here by lifepsy over three weeks ago. Since then it was edited and promoted by bornagain77 on more than one thread, and promoted by me on more than one thread as well, along with the accompanying article. The subject never made it to an OP until today, and never seemed to generate much interest. I can’t say why; both myself and Ba77 have brought it up repeatedly since it was originally linked to here. I think UD would benefit by providing a way to call attention to this stuff sooner, when it comes up. Perhaps now that “News” is more active, some of these remarkable developments can get attention while they’re fresh. Excerpt: When I pointed out the potential of domain shuffling by natural genetic engineering to Intelligent Design advocates who claimed protein evolution by natural mechanisms was impossible, they refused to recognize genomic data as irrefutable evidence and insisted on real-time experiments. I disagree with them strongly on the DNA sequence data. Shapiro admits he has no ‘real time’ empirical evidence for the origin of novel protein domains and/or genes by Darwinian processes (so as to be able to have the ‘protein domains’ to shuffle around in the first place) but must rely, as do neo-Darwinists, on the DNA/protein sequence similarity/dissimilarity data to try to make his case that novel protein domains were created in the distant past so that ‘natural genetic engineering’ can presently create all the diversity we see in life on earth today. Yet, just as with neo-Darwinists, Shapiro relying on sequence similarity/dissimilarity data to ultimately try to make his case for ‘natural genetic engineering’ has the very same ‘unscientific’ problem that neo-Darwinism has of assuming the conclusion beforehand to try to prove the very question being asked. The primary problem is never addressed! i.e. Can the novel functional information we see in protein domains and/or genes ever be generated in a ‘bottom up’ fashion by the unguided material processes of neo-Darwinism? The answer to that question, as far as empirical evidence is concerned, is a resounding NO. Excerpt: In one study evolutionists estimated the number of attempts that evolution could possibly have to construct a new protein. Their upper limit was 10^43. The lower limit was 10^21. These estimates are optimistic for several reasons, but in any case they fall short of the various estimates of how many attempts would be required to find a small protein. One study concluded that 10^63 attempts would be required for a relatively short protein. And a similar result (10^65 attempts required) was obtained by comparing protein sequences. Another study found that 10^64 to 10^77 attempts are required. And another study concluded that 10^70 attempts would be required. In that case the protein was only a part of a larger protein which otherwise was intact, thus making the search easier. These estimates are roughly in the same ballpark, and compared to the first study giving the number of attempts possible, you have a deficit ranging from 20 to 56 orders of magnitude. Of course it gets much worse for longer proteins. Excerpt: each particular helix or sheet has a distinct set of side chains sticking out from it, requiring a distinct set of chemical interactions with any nearby protein sequence. Thus, helices and sheets are sequence-dependent structural elements within protein folds. You can’t swap them around like lego bricks. This necessarily means that when you bring new secondary structure elements into contact by some sort of rearrangement, they will be unlikely to form a stable three dimensional fold without significant modification. Summary: “The Law of Physicodynamic Incompleteness” states that inanimate physicodynamics is completely inadequate to generate, or even explain, the mathematical nature of physical interactions (the purely formal laws of physics and chemistry). The Law further states that physicodynamic factors cannot cause formal processes and procedures leading to sophisticated function. Chance and necessity alone cannot steer, program or optimize algorithmic/computational success to provide desired non-trivial utility. Ba77 @10, Good comments. To paraphrase Cornelius Hunter, Nobody knows what the next theory of naturalistic origins will look like, but it will definitely be called evolution. One of the problems I have with the notion of “natural genetic engineering” is the word natural. Suppose a discovery is made where a new protein emerges through domain shuffling. Great. If it were the result of a signalling response, triggered by the environment, such a function that could respond to the trigger by building a “novel” protein would be dependent on an existing mechanism, probably an irreducibly complex one. Under the rubric of natural genetic engineering, this event would be considered natural, and I think that begs the question. What force or law motivates such a triggered response? None do. It would be the result of programming, not physical law. Remember that rapid evolution of lizards that “evolved” cecal valves? Same issue. To label such an events as examples of evolution, or as natural processes, is misleading at best.